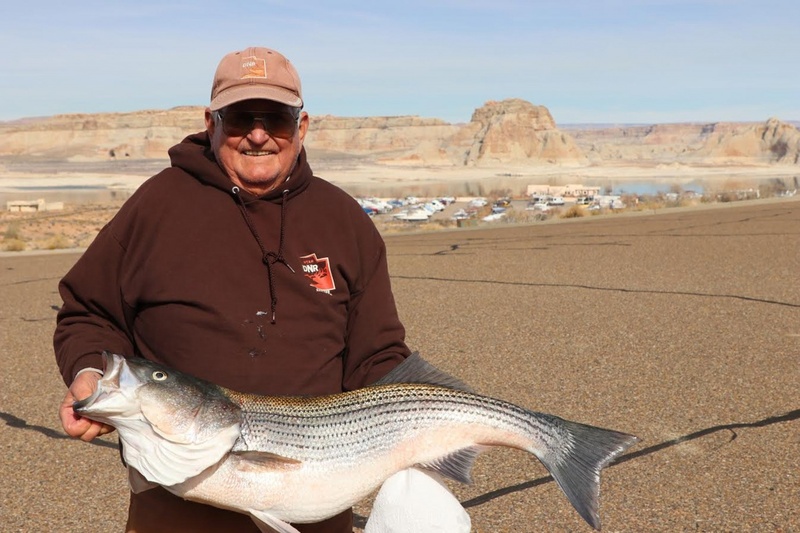 Nob Wimmer caught a 20-pound striper! Lake Elevation: 3574 – Water temperature: 45 F My last fish report suggested a pattern for finding striper schools by cruising toward the back of a major canyon while watching the graph for a quick depth change from deep water to a consistent depth range of 65-85 feet. On Feb 12th there was finally a small break in the weather where the sun was out with no wind blowing. We loaded the open boat with no windshield, put on ski goggles and headed to Warm Creek. Normally the trip to Warm Creek takes 10 minutes from Wahweap but with low water, the Castle Rock Cut is closed and the 15-mile ride is closer to an hour. Fishing could not have been much better, but then that changed as well. Nob Wimmer was using his homemade 1.5-ounce spoon and consistently tossing stripers in the cooler. Then he said, “I’ve got a big one”. He said the same thing on a trip to Warm Creek on December 12, 2017, and eventually put a 30-pound striper in the boat. I looked at his spinning rod bent over double, watched the line going out and knew we were about to see another trophy striper. The time was 10:15 AM and the fish finally turned over on the surface at 10:30. I grabbed it by the jaw and brought it into the boat. The fish was 38 inches long but we did not know the weight until we placed it on certified scales back at the office. This fish weighed 20 pounds (officially 19.45 lbs). Quality of life is measured by the amount of time spent fishing.